Holy cow, we’ve been busy. The good news is that the tile in the kitchen is all done. Now, we are waiting for the counters to show up. After that, we’ll tile the back-splash and install some LED, under cabinet lighting and be done with it. 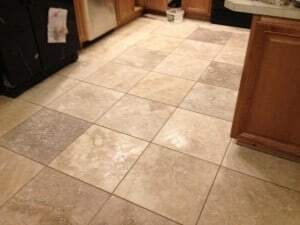 I’ll show you some pictures and also tell you some of my favorite kitchen remodeling tips when the whole thing is done. Also, the Thursday rant will be back next week. I have a good one brewing, but it’s not yet ready for prime-time. Some people enjoy going to beaches or mountains on vacation. However, I’m a bit of a money nerd and one of my favorite weekend getaways with the wife is the Berkshire Hathaway shareholder meeting. This weekend, we head to Omaha to see Mr. Buffett and Mr. Munger in person. Now, this is no ordinary shareholder meeting. Bill Gates and many other billionaires are in attendance. The atmosphere is electric. Best of all, the audience gets to pepper Buffett and Munger with questions all day. Some of the questions are awful*, but others give you little windows into the minds of these financial titans. Making the experience even better, we’re meeting up with Mr. and Mrs. PoP of Planting our Pennies fame. I had the pleasure of meeting Mrs. PoP last year and I’m really looking forward to meeting Mr. PoP this year. Hopefully, the ladies don’t get bored with NSX chatter**. A 12-foot-tall inflatable Geico gecko! Well, not really. I don’t even remember exactly how I became interested in Warren Buffett. I vaguely remember reading something about a decade ago that caused me to pick up some Berkshire Hathaway shares. I then promptly forgot about them for at least 5 years. On a whim, one day I decided to see how they were doing and I was pleasantly surprised to see that they had more than doubled. It was at that time that I realized I needed to pay more attention to Warren and Charlie. 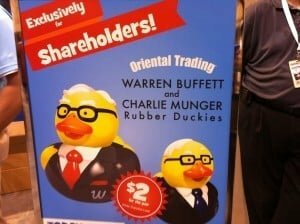 Last year’s collectible Buffet/Munger ducks. I started reading the annual reports which I used to deposit straight into the recycling bin. I read Buffett’s biography and other books. The picture became clear; Buffett provided instructions on how to handle your investments and I had been doing a lot of things wrong. Buffett set me straight***. Anyway, if you haven’t, do check out Buffett’s annual letter. Go on, I’ll wait. OK, if you didn’t read it, let me entice you with some of my favorite passages from this year’s letter. If nothing else, please do read the last one. It’s pretty great. Charlie and I have always considered a “bet” on ever-rising U.S. prosperity to be very close to a sure thing. America’s best days lie ahead. Buffett and Munger are very optimistic about the future of America. This is refreshing considering all of the doom and gloom news spit out by the mainstream media. Great investing advice. There are no quick riches, but there are riches for those who are patient and consistent. I love this one. There is so much garbage out there. A smart investor learns to ignore the noise. A climate of fear is your friend when investing; a euphoric world is your enemy. Fantastic advice. The long term market trajectory is up, but there will be short term setbacks. When the next recession hits, stay put. Better yet, take advantage of some of the deals out there and put cash to work. The PoP’s duplex purchase in 2009 is a stellar example of this mentality. Anyway, see you in Omaha at this Berkshire meeting or a future one. I guarantee you’ll have an awesome time. After the meeting, I’ll even buy you a pint! However, be prepared to listen to me yap on about Buffett, Munger and Berkshire. *Someone asked,’When are you going to split the A shares?’ Ummm, that is what the B shares are for. ***This is still a work in progress. I still own shares in companies (cough, cough facebook) that Buffett would never, ever touch. 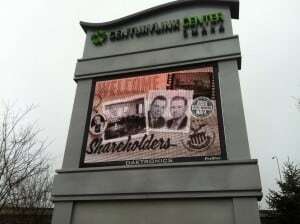 The shareholder’s meeting sounds like a good way to spend a weekend. I particularly like that “Keep things simple” tip you shared from the annual letter. I honestly don’t know all that much about Warren Buffett or his company, but I like that he takes the time to share his wealth of knowledge. Yes, the fact that is so willing to share makes him totally awesome. Read his letters, they are great and inspiring. I definitely would love to get out to one of these meetings at some point in my life. Such an impressive man, Warren Buffett. Do it! Soon. He is 83! Munder is 90! I hope you think it’s as awesome as I’ve been hyping it up to be. I can’t say enough good things about it really. Prepare to take lots and lots of notes. Buffet sure is something special. I forgot to buy some B shares over the past year so no annual meeting for me this year. I’ll have to put that at the top of my list of things to do. JC @ Passive-Income-Pursuit recently posted…Does The Procter & Gamble Company Belong In Your Portfolio? Do it, you won’t regret it! Almost scary timing Mr. 1500. I posted on your last post that I was concerned you had tiled yourself into a corner and then you magically appear a few hours later. Mrs. Grump calls it testosterone poising when I have a “great idea” such as investing in individual stocks or real estate I know nothing of and spend days babbling and researching it before I say no to myself. Alas, I just purchased my first .079 shares of Berkshire for the Junk Food Experiment since they own Dairy Queen. Hopefully, this time next year I will be up to 1 share and earn myself an invitation to the party. I like this, The fact that you take time to think through the idea shows a lot of maturity. I admit to buying stuff because a friend thought it would be a good idea. One of these went to 0. Another friend told me he thought “Google would be a bad idea,” so I cut the amount I bought at IPO in half. Those were 2 very, very pieces of advice. If I had used my noggin a bit, perhaps I would have avoided them. I’ve been meaning to buy a minimum of one share so I could make it to the shareholder meeting. Are you going to switch from owning individual funds to index or ETFs? Hi SFL! Yep, I’m moving much of my stuff over to Vanguard. I admit that I’ll probably always own some stock (I enjoy the thrill), but it won’t make up a significant portion of my portfolio like it does now. That’s pretty exciting. I can’t imagine anyone not liking Warren Buffet. I used to work for Kiewit Construction, and I got to tour the office that Peter Kiewit and Warren Buffet shared (at the time, Warren still used it). It was neat to see. Chattanooga Cheapster recently posted…The Cheapster Saves – With Ooma!! Nice and I know just what you’re talking about from the Buffett book. Very cool. Ha, they call it the Woodstock of Capitalism. It is like a big party. The mood is celebratory and fun. I can see why too. You’re sitting with 40,000 people, many of them are millionaires that got that way with the help of Buffett. Have fun, you crazy kids! So, stupid question: how would one go about buying a single share of Berkshire-Hathaway stock? Ha, we are crazy, at least I am. All you have to do is buy 1 share of BRKB through your online trading account just like you’d buy any other stock. As of this writing, they are selling for $128.85 each. Alternatively, you can go as our guest. We get four passes every year and the little 1500s would NOT enjoy this event. Except for the rubber ducks. Say hi to my hometown for me. . .once we get out to your neck of the woods, we need to go and check out two things that I’ve always wanted to do. . .RAGBRAI and the Berkshire Shareholder meeting. I’ve been a shareholder since I was 18, but never been to the meeting. This is sad. Oh, and don’t forget to check out LaCasa’s Pizza!!! Go for the classic beef with Romano cheese instead of Mozzerella! Kitchen looks great! RAGBRAI is great! We’re sad to miss it this year, but I’m game after that. It’s a bit like the Buffett shareholder meeting. It doesn’t sound like fun, but is actually great. We have plans to check out LaCasa’s. Thank you for the recommendation. The kitchen has turned out awesome. Just wait until the counter-tops and back-splash tile is in though. Perhaps we’ll work on your sometime in the near future? Absolutley on the kitchen! Sounds like a plan 😉 Ok, I’m really not helping your waistlines here with all of my recommendations, but Zesto’s in Omaha for Ice Cream is an institution. . .they moved their location to downtown and if they are open (usually they open in Spring), it’s also worth checking out. Have fun! Thanks Jeff! I think I need to find a good gym in Omaha to go along with all of your recommendations! I thought of you guys a couple of weeks ago when I saw a black NSX parked in a mountain outlet mall. It was kind of funny to see all the dudes who walked by do a double-take, then try to discreetly snap a picture with their phone. Ha, cool! I sooooo want one, but I won’t do it until I’m FI. The tile looks awesome – I’m impressed! The meeting sounds super interesting and I’d be curious to see what some of the shareholders’ questions are. I’m sure it’s a super educational event! Thanks Addison! Tune in for a full report about the meeting in a couple weeks. First time posting here but I’ve been reading your posts for a bit. I keep hearing good things about the Oracle of Omaha. Hopefully I’ll get around to buying a share or two and make it to a future shareholders’ meeting before they kick the bucket! The meeting must be like going to summer camp, but better. P.S. The tile work looks great! Kassandra recently posted…Living Below Your Means, Your Way! First of all – the tile looks great! Love the neutral colors. Secondly, I NEED to become a shareholder, and fast! 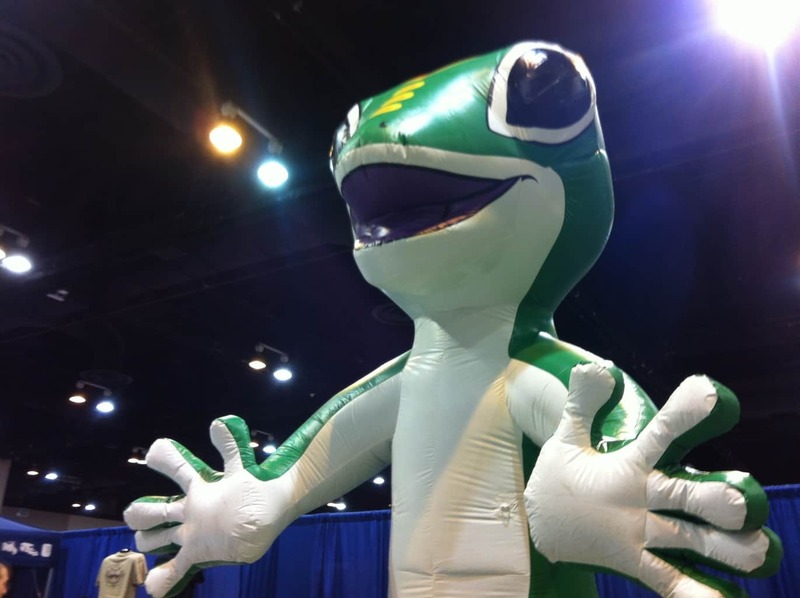 I would love to attend one of these get-togethers – sounds like so much fun and tons of insight! Thanks Lisa for the kind comments about the tile. Wait until you see the finished kitchen though. Come on countertops! Berk meeting is awesome! Go! Wise choice to actually take your wife and go straight to Omaha to see Warren Buffett in person, I’m totally sure he will inspire you and offer you a good motivation in your way to success.